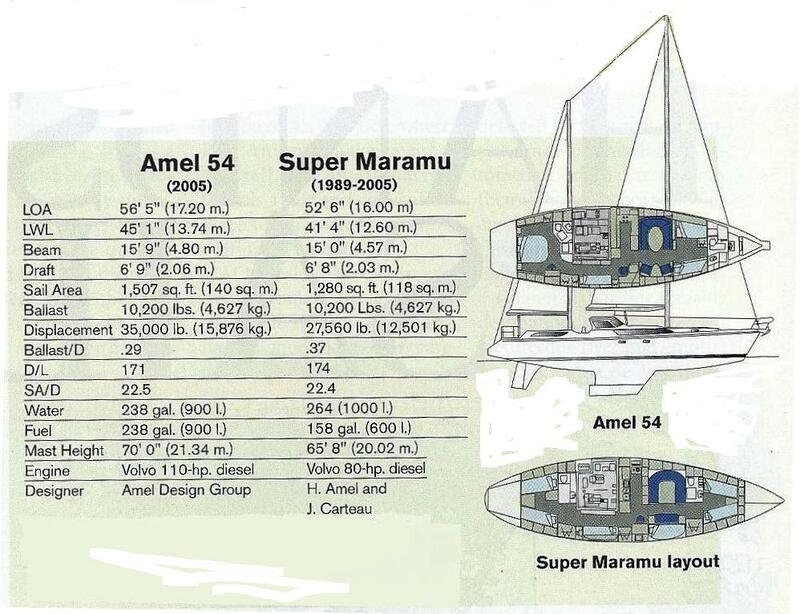 Since 2002 we were sailing on Alma Libre , an Amel Super Maramu 2000. 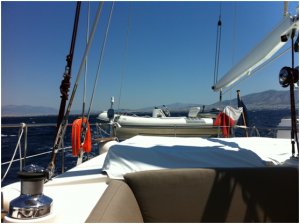 We had nice memories and we have used the boat as much as possible in the Aegean Sea sailing in all the seas of Greece. From the northern Greek water to Skyros, Allonisos, Skiathos and to the Ionian Sea and the Dodecanese. We sailed with good weather and bad weather with storms and calms with children as crew and other racing sailors. We accumulated a lot of experience. 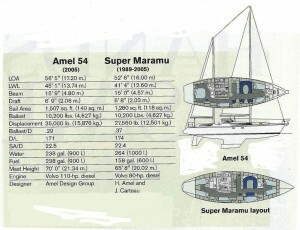 When I decided to change the boat I knew all the weak points of the AMEL Super Maramu 2000. I wanted to live the next 10 years of my life with a more suitable boat according to my needs and the seas I am using the boat the most. The most important points that led me to choose the Amel 54 were the following. I used rarely the twin poles of the SM2000, although when I used it the boat was sailing fast and extremely stabledownwind. I used a lot the bow thruster and I always felt that this was vulnerable due to the open propeller in the sea and thepossibility to catch a rope or a plastic bag especially in Kalamaki the harbor we moor the boat ,so I needed a system more reliable, although I was able to repair the SM2ooo system easily in Greece either with spare parts from AMEL or from improvised spare parts manufactured in Greece in local machine shops. I rarely used the second alternator that AMEL mounted on the sail drive in order to charge the batteries while sailing so Idecided that it was not necessary for the Greek seas. I strongly needed the second smaller sail in the inner staysail as we were sailing in strong wind to windward quiteoften. What I needed was also the hydraulic passarele. The old system of the Sm2000 was very difficult to be deployed inthe Greek harbors. The passerelle was always in touch with ropes bollards and other obstacles on the quais . Without touching the quay the passerelle was useless. The one sided fastening with the halyard was problematic and putting it to the side forbathing was not so easy and we forgot it in the water for a few times. So a new system was preferable. The next important point was the dinghy. We always wanted a more powerful dinghy with a hard bottom to be able to stay dry while travelling, carry more passengers and also use the dinghy in the night with suitable night lights. The only solution was the installation of davits on the stern, I hope that this was a good decision. I decided to buy the Novurania HD 335 dinghy with a 20 Hp Yamaha engine. 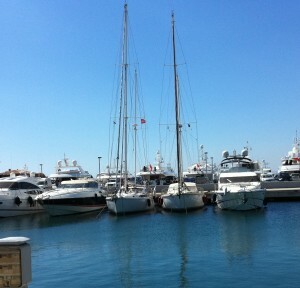 We will hang it to the davits when we arrive in Greece. In the winter I plan to leave the RIB and use a smallerinflatable bottom dinghy with my old 8 HP engine. I was somehow skeptical about Amel 54 having a more rigid cover for the cockpit, I did not know if this was suitable to my preferences, as I always want the wind to touch my head. The good thing is that both windscreens are opening in order to make a more open environment in the enclosed cockpit and provide also more air to the main cabin in the aft sateroom. The other nice feature was the second chart plotter/radar in the cockpit after our long trip to Hyeres we felt the necessity to have a second screen close to the cockpit. For anchoring I decided for 100 meter of stainless steel anchor as a main anchor as the 60 meters on the SM was relative short and the stain less steel provides better stowage of the anchor. I decided to have the possibility to flush the toilets either with sea or fresh water. In order to avoid the smell in the harbor during the winter I will switch the toilettes to normal water and in the summer when we are using the boatconstantly I switch to sea wate. I also allowed the capability to rinse the deck with sea water to avoid usage of the precious water. I had installed the sea water rinse on Alma Libre and used it a lot during the summer to avoid the heating of the deck floor. 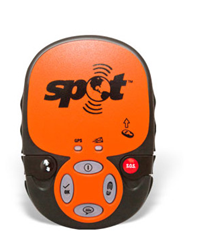 A new device that I have on board is the Spot me. This is a satellite messenger that can alert friends when you have an emergency and show your route on a map. This was a new devise recommended to us by a fellow sailor which we decided to use onboard and to map our position on a map either in their own site or on the “mailasail” site, where we plan to keep our log for the trip. After 3500 miles and 35 ports I can say that the AMEL 54 is much better than the Super Maramu 2000. It is by far more comfortable the tent is excellent to protect you from the sun the cushions on the cockpit are very well manufactured and make the cockpit much more cozy and relaxing. The light inside the boat makes it much more welcoming and in the night it is possible to stay inside in nice place to relax and read . The anchor has excellent holding and automatically storable perhaps not so easy as the delta anchor so you need to put the last meter carefully up to put her correctly to her position the remote control helps on that very much. However, the anchor command is extremely bad and I used all the time the remote control of the anchor for mooring. The sail handling is different mainly due tothe battens on the mainsail and mizzen so you have to keep the boom down and bring the boat to windward in order to take in the sail which is something that you avoided on the SM2000 as you could release the sheet of the sail and bring the boom to windward . This is something that you have to learn and it changes the use of the boat especially in bad weather as you have to go for a few minutes to the wind. The sails have excellent cut and quality. I am impressed also of the stability of just the jib without the main in downwind sailing. The Furuno autopilot performs excellent in heavy seas from the back which is the most difficult steering angle. The B&G instruments are good but the wind indicators shows only apparent wind direction and no true wind so in that case you need some experience to decide if the wind and angle is suitable to put the sails on the Raymarine instruments it was easier to have a reading of the true wind angle and force. I use a lot when sailing a nice feature of the Navnet 3d that has displays two analog instruments on the display with apparent and true wind that was very useful when sailing. The Navnet 3d performed well throughout the trip but you need to study it carefully to utilize all its capabilities and to make the display according to your preferences. The new version of Maxsea time zero is confusing and needs very careful operation during a trip not to come in conflict with Navnet 3d parameters and create a problem. The Iridium phone performs very good and was very helpful to provide security and data transfer in difficult situations. A 3G router is installed on board and by buying a local data mobile card we were able to have a wifi onboard with very good performance and low cost 20 Euros for 3Giga bytes for 30 days. The PC is connected with the television by an HDMI cable and with this we are able to have a view of the Maxsea screen with the radar on the TV which is good for dinners we have all together during the crossings and overnight passages. Inner lighting is improved allowing for comfort while indoors entertainement. The new arrangement of the boat is much better compared to the SM2000 the washing machine and the dryer in front of the boat are much more comfortable for the use of them as you do not hear the noise and the humidity in the salon. Captain’s cabin is far more superior, with abundant storage, cupboards, a comfortable double bed, light and a lot of fresh air. I am sure that the double cabin in front and the double couchettes are more comfortable than the previous boat. The full time high capacity inverter changes a lot the use of the electric appliances and an espresso onboard for the night shift is a good support. Little details also enhance the quality of living and sailing: better access to the sea with the bathing platform, the ourside warm water shower stern side, the deck on the back allowing comfort for a swim od dive, the reading lamp by the bed..
antenna amplifier is hidden behind the right armchair on board and is difficult to locate and find out if there is a problem. I had a problem of power supply due to a damaged fuse holder. elegant and has a low profile. The fuel tank is on the bottom and the hull is deep to be able to be driven in waves. davits to hang correctly which is not easy to be made. We used a special stainless steel plate which was made to move the back support point and the front support point was transferred in the a small locker in the front and it was glassed in for more rigidity. The overall design was not easy . On the davits I have special ratchet belts to keep it firm and stable during sailing. The overall construction was worth. The dinghy looks nice hanging on the davits and the use of them is very well. I was very reluctant that the combination of the davits and the dinghy will make my mooring of the boat med style difficult but it seems that after some exercise we do not have any problem. In harbors that you do not know we will lower the dinghy and keep it in front as we have done in the past with the inflatable bottom zodiac. 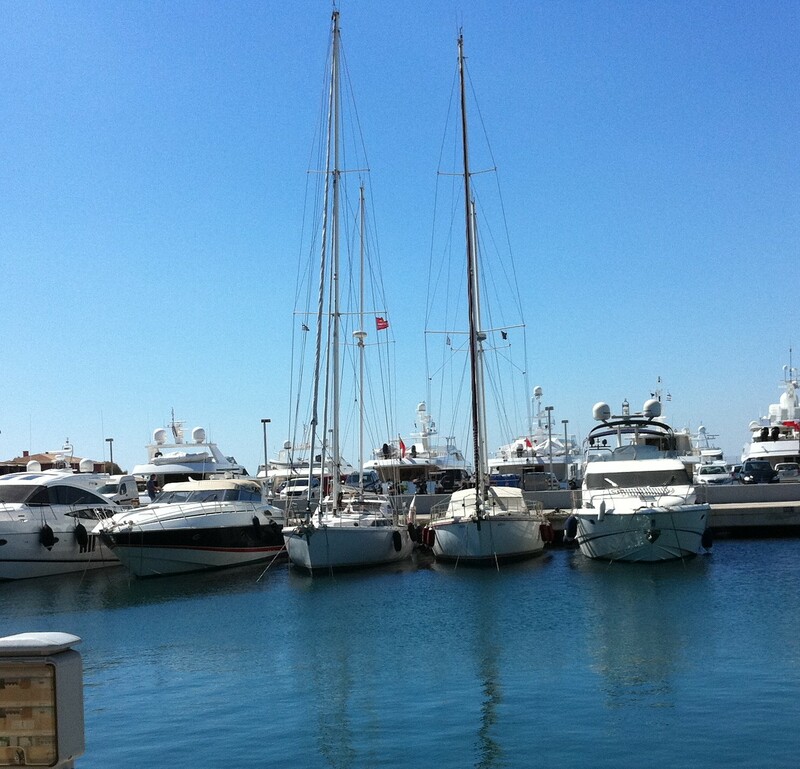 The docks in Greece are relative high so the dinghy can be lowered and the passarelle unfolds easily over it. We ended up with a nice combination that changes completely the boat use with a powerful rib easily to be stowed onboard and easy to be lowered and prepared. The WASI anchorworks very nice and my first remarks that it can not be stowed on the anchor base from the cockpit are now over after my first 3 anchorings I can do it from the cockpit. Of course the remote control is a must for operating the wind lass when mooring the boat as you have to operate the windlass and bow thruster together with the engine throttle at the same time. Last time we moored the boat in Poros the flag pole was tangled with a shroud from the boat next by so it is more wise to remove the flag. The boat was left on the side of the smaller boat but even with equal length boat there is room between them to keep the boat safe between them. The Amel 54 is a better boat more sophisticated and it offers everything that was missing from the SM2000. Regarding the sailing charactetristics they can be described as different and I will explain the reasons. The boat is faster and has more sail combinations to be tried. The windward characteristics are better and with the staysail going to windward with heavy seas is a pleasure. Also all living fascilities are superior. Has it is worth the double money you have to pay for the Amel 54. 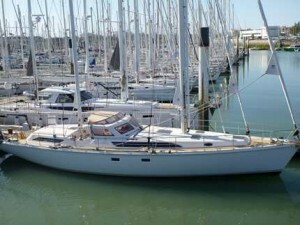 During the delivery of my Amel 54 the chantiers Amel announced a new boat the Amel 55. I was at the beginning very disappointed that they have not informed me on time but after 3500 nm on my Amel 54 I am sure that a have an improved Amel boat and not a boat from a different designer adapted to the Amel standards that needs to be improved in order to be without the child deseases that all new boats have. 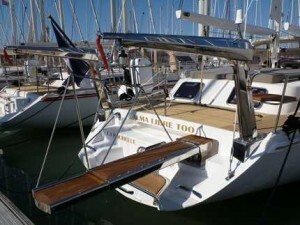 Alma Libre Too is a very improved version of the first Amel 54 and we are going to sail it as much as possible. The new Amel 55 has a fully enclosed cockpit which is not our preference as in Greece the weather is warm and I prefer to face the wind to feel the strength and direction which is the essence of sailing and hand steering. Written by: admin on September 6, 2011. Last revised by: on October 10, 2011.
thank you, Dimitris, we put a lot of consideration in this article..